Stay on track in the garden all year long with my new book, Illinois, Indiana & Ohio Month-by-Month Gardening: What to Do Each Month to Have a Beautiful Garden All Year. It showcases my down-to-earth, common-sense approach to Midwestern gardening, focusing on sustainable methods. The book from Cool Springs Press, to be published Feb. 1, 2016, is an evolution in the publisher’s series of month-by-month books. 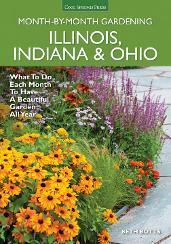 With a fresh look and updated information, Illinois, Indiana & Ohio Month-by-Month Gardening includes all the when-to and how-to information that has made these books so popular over the years, presented in a new, easier-to-use format with more full-color photography and the most current information available. With 208 pages and 258 color photos, the paperback book is priced at $24.99 and is available at independent booksellers and on Amazon.com. From planting to watering and fertilizing, and from maintenance to problem-solving, Illinois, Indiana & Ohio Month-by-Month Gardening shows all levels of Midwestern gardeners the best practices to grow satisfying and rewarding results. It’s the perfect companion to take the guesswork out of gardening and have success all year, from January to December.